No pain, no gain? Not in this case. 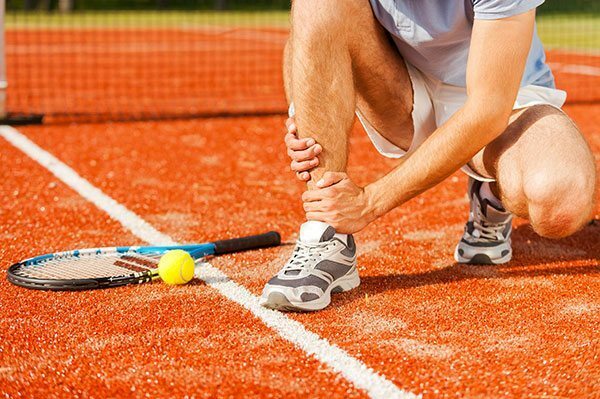 The Foot and Ankle Clinic’s Tennis Podiatry will help you get more from your sport. Tennis is a racket sport that requires speed, power, endurance, balance and coordination. It can be played individually against a single opponent or between two teams of two players each. The object of the game is to play the ball in such a way that the opponent is not able to play a valid return. There are three main surfaces that the sport is played on. Each playing surface has unique corresponding footwear considerations that are important to preventing injury. As a result of the high speed on racquet impact, repetition and use of your spine, legs and especially your dominant arm, there can be a variety of shoulder, elbow, wrist, knee, ankle, hip and spine injuries that can develop. Lower limb injuries are the most common. They are caused by the sprinting, stopping, pivoting, jarring and pounding nature of tennis. These can be acute e.g an ankle sprain or chronic e.g. knee tendonitis. The ailing tennis player can benefit from a Podiatrist who is knowledgeable in the intricacies of play on multiple surfaces. Those athletes who have experienced significant fatigue due to years of play on hard courts can benefit from switching to a well-maintained clay court with the appropriate shoe. 1) Hard court, a mixture of rubber acrylics, silica, asphalt or concrete and sand. 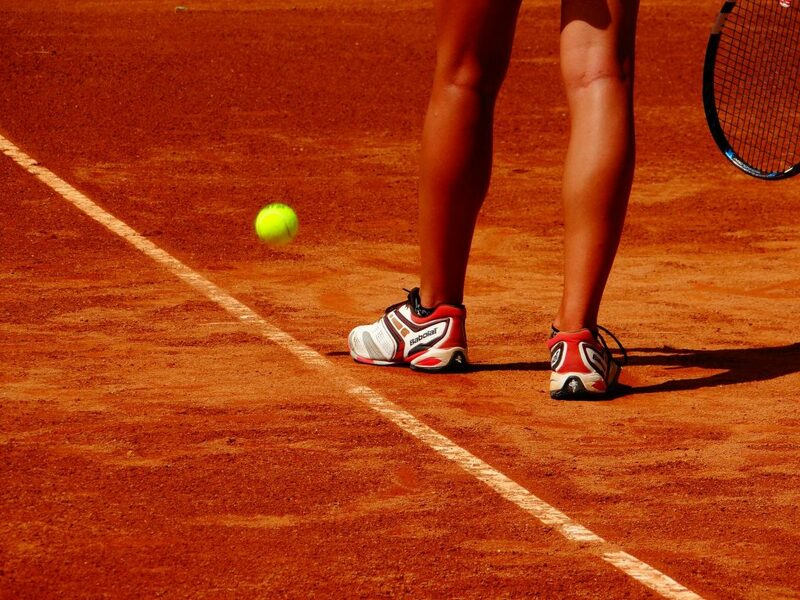 the tennis shoe can “catch” on clumps of clay causing ankle sprains (court is too moist). 4) Carpet tennis courts are uncommon for routine play given their high propensity for injury. Carpet tennis courts are sanded to allow for the softness of grass and the traction of clay. However, if the sanding is not uniform, unsanded spots will snag the plantar outsole of the shoe. Spots with too much sand can cause slippage. Hard court shoe: A rule of thumb on tennis courts is that “the harder the surface, the heavier the shoe should be”. Most hard court shoes are manufactured at around 14 to 15+ ounces for a size 10.5 shoe. This bulk gives the shoe’s outsole durability and cushioning for hours on unforgiving asphalt or concrete. Those who predominantly play on hard courts should avoid lighter, clay-specific shoes. Clay court shoe: Shoes with a herringbone pattern. These shoes are on the lighter end of the spectrum (10 to 13 ounces for a size 10.5 shoe). They are forgiving on wet surfaces but are also able to grip slightly dry surfaces. For patients who slide into their shots, a commonly taught technique on clay surfaces, place a layer of adhesive felt on the underside of the shoe’s vamp to prevent the forefoot from jamming in the toe box. Such a sliding motion can cause: blisters, onychodystrophy, onycholysis, subungual hematoma, turf toe and hallux limitus. Carpet court shoe: hybrid shoe and the participant must pay close attention to the condition of the court. At the Foot and Ankle Clinic our highly qualified team of Podiatrists are all members of the Australian Podiatry Association and offer a combined 50 years’ experience. They are trained to diagnose and effectively treat tennis injuries via a range of treatments.